Growing up in Louisiana, every season was barbecue season. The weather was never too cold to throw open the pit, pile on a colossal amount of marinated meat, and let all the flavors socialize for hours under a blanket of smoke. I have watched my grandmother and grandfather (whom I lovingly refer to as paw-paw) barbecue since I can remember. Grandma was like a magician with barbecue. We would drive down her driveway, and I would spot the silver, barrel-like pit next to the house. I knew automatically it was going to be a fantastic day. I would walk into her kitchen and the smell of sweet rolls and smoked meat met me at the threshold. There, on the counter, was a pile of chicken, sausage and brisket that had been covered in a cloud of smoke until perfectly cooked, juicy and scrumptious. Paw-paw, being the most patient man I know, treated barbecue like a work of art. He would baste the meat every thirty minutes or so with Jack Miller’s Bar-B-Que Sauce to add even more flavor to the meat. The women would be in the kitchen fixing all of the trimmings: potato salad, garlic bread, fresh tomatoes and cucumbers, and baked beans. There would be a picnic table with red-checkered tablecloth set up under the oak tree with all of the barbeque and fixings stacked high. That’s how I remember barbecue. The warmth of the pit would be like the warmth of the oven in the kitchen. It brought people together. The barbecue pit was as much of a hearth for my family as the kitchen was. 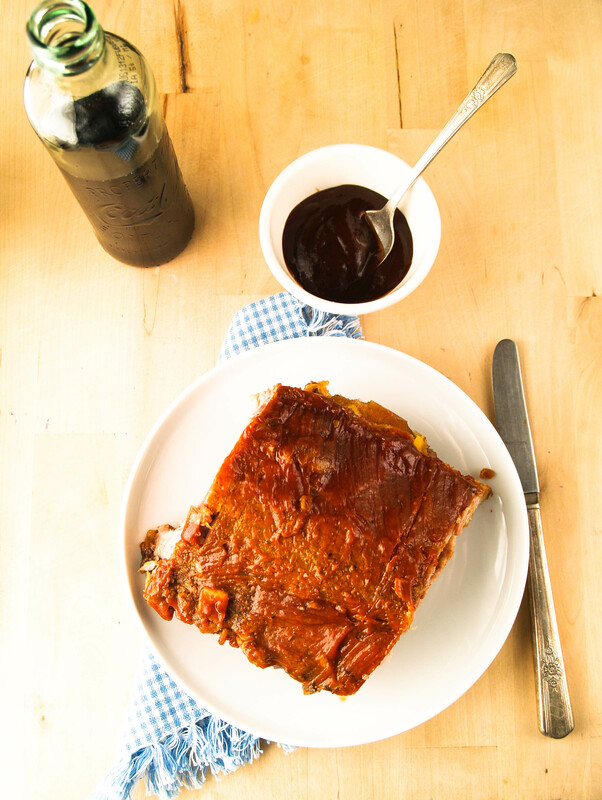 Season ribs and wrap the ribs in heavy-duty aluminum foil and place them on a baking sheet. Cook them low and slow for about 3 hours. Cook bacon on a saucepot until brown. Add onion and garlic. Cook until translucent. Add ketchup, dry mustard and vinegar. Season with salt and pepper. Cook until all of the ingredients are melded together. Slather the sauce on the ribs when they come out of the oven. Put them back in the oven for 15 minutes until sticky and delicious. Yum Yum delicious! I want to kiss this it’s so good! These things are delicious! If you have ever been to a restaurant in Baton Rouge, Louisiana called T.J Ribs, I think that Ambers ribs are better! 🙂 I agree with Tori, I want to kiss them 🙂 Dellciousnessness! !